Sea Ice News Volume 3 Number 3 – Beaucoup Bering Sea Ice | Watts Up With That? 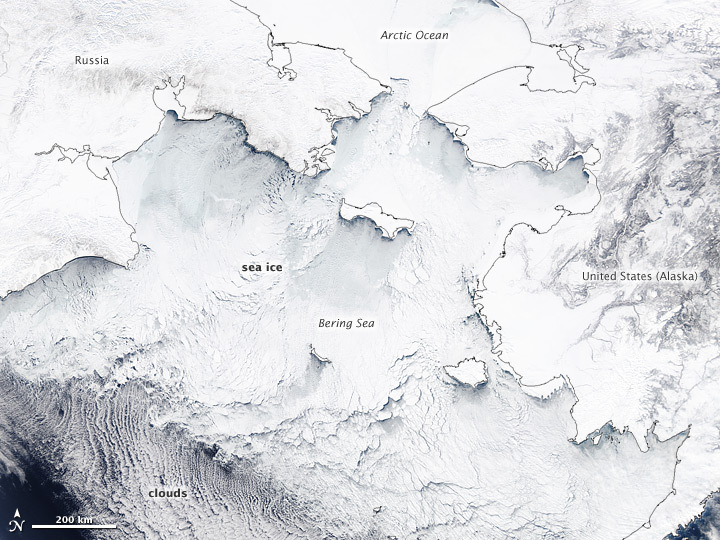 For most of the winter of 2011–2012, the Bering Sea has been choking with sea ice. Though ice obviously forms there every year, the cover has been unusually extensive this season. In fact, the past several months have included the second highest ice extent in the satellite record for the Bering Sea region, according to the National Snow and Ice Data Center (NSIDC). The natural-color image above shows the Bering Sea and the coasts of Alaska and northeastern Siberia on March 19, 2012. The image was acquired by the Moderate Resolution Imaging Spectroradiometer (MODIS) on NASA’s Aqua satellite. Black lines mark the coastlines, many of which have ice shelves or frozen bays extending beyond the land borders. The accumulation of ice this season has largely been fueled by persistent northerly winds blowing from the Arctic Ocean across the Bering Strait. The local winter weather has been dominated by low-pressure systems—with their counterclockwise circulation—that have brought extensive moisture up from the south to coastal and interior Alaska, while sending cold winds down across the sea to the west. Those winds pushed Arctic sea ice toward the narrow, shallow strait, where it piled up and formed an ice arch that blocked the flow. As arches fail because of wind stress, large floes of sea ice can move south into the Bering Sea. Ice also has piled up on the north side of St. Lawrence Island, near the mouth of the strait. South of the strait and the island, those same winds push cold air and cold surface waters to lower latitudes, allowing the ice to grow farther south than usual. The widespread and persistent ice cover in the Bering Sea has posed significant problems for fisherman and for supply ships in the region. The weather driving the ice also brought extreme snowfall events to many parts of Alaska this winter. The Bering Sea stands in stark contrast to the rest of the Arctic ice cap, where sea ice extent was below average in both January and February. 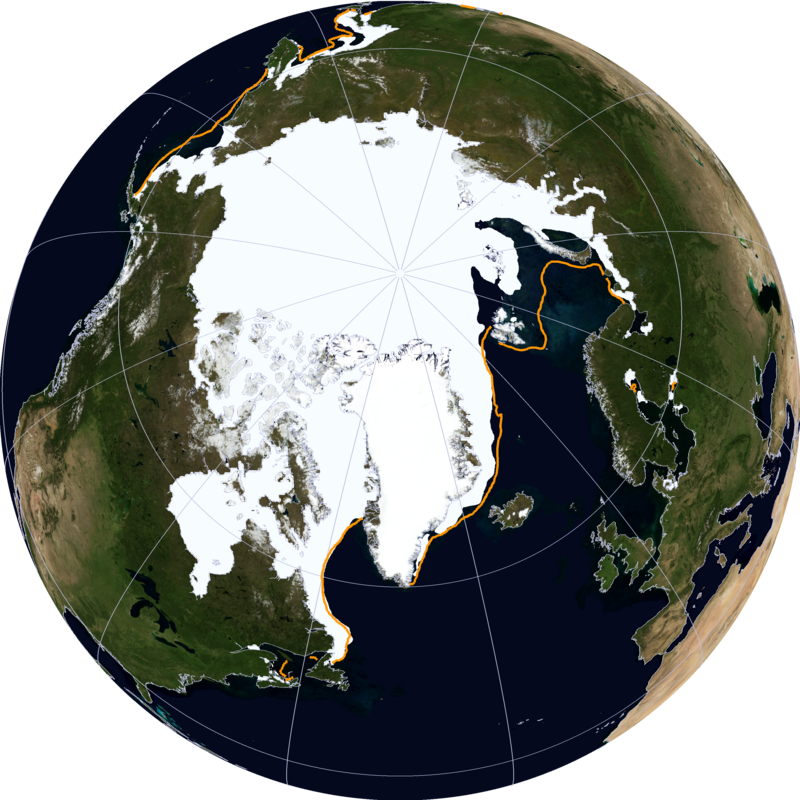 Ice cover was down drastically on the Atlantic Ocean side of the Arctic, including the Kara, Barents, and Laptev Seas, where air temperatures were 4 to 8 degrees Celsius (7 to 14 degrees Fahrenheit) above the norm. 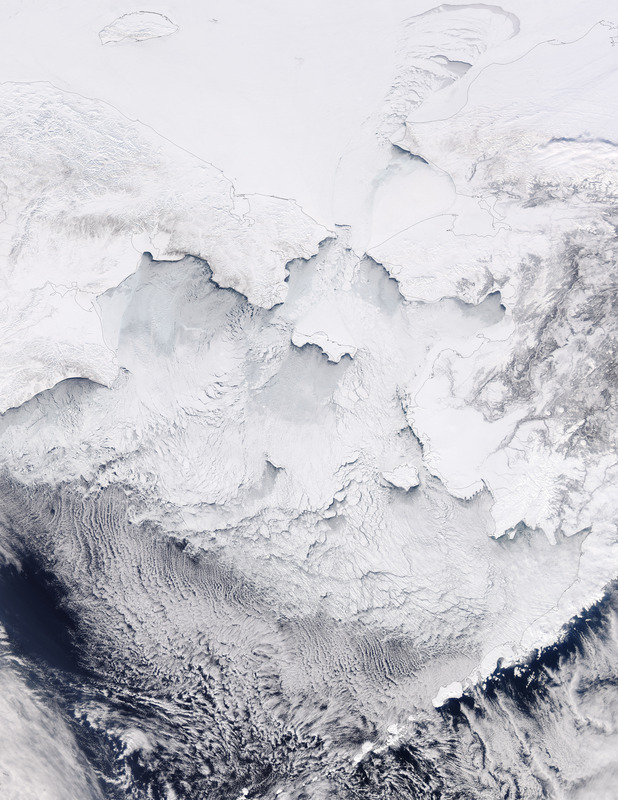 NASA Earth Observatory (2012, January 22) Sea Ice off Southwestern Alaska. National Snow and Ice Data Center (2012, March 6) February ice extent low in the Barents Sea, high in the Bering Sea. National Weather Service, Anchorage Forecast Office Alaska Sea Ice Forecast. Accessed March 19, 2012. NASA image by Rob Simmon based on data from Jeff Schmaltz, LANCE/EOSDIS MODIS Rapid Response Team at NASA GSFC. Caption by Mike Carlowicz, with image interpretation by Walt Meier and Ted Scambos, National Snow and Ice Data Center. Can polar bears put climate change back on the agenda? For various reasons, the climate crisis has disappeared from the political dialogue. This is unlikely to change in 2012, unless polar bears put it back on the agenda. You may recall from Sea Ice News Volume 3 number 1 and in subsequent comments its was revealed that The Arctic Institute is run out of the family apartment of founder Malte Humpert in Washington, DC and has no actual physical presence. Malte Humpert apparently didn’t like the attention. Scientists from the U.S. Naval Research Laboratory Marine Geosciences Division are assisting NASA, the US Army Cold Regions Research and Engineering Laboratory (CRREL) and the European Space Agency (ESA) in developing more accurate monitoring and sustainable forecasting of Arctic sea ice. The NRL team, using a specially equipped de Havilland DHC-6 Twin Otter aircraft (similar to aircraft shown), collect data to aid in the validation and calibration of data captured by the ESA Cryosat-2 satellite. Recent dramatic changes in the characteristics of the Arctic sea ice cover have sparked interest and concern from a wide range of disciplines. The demand for an improved ability to monitor and forecast changes in sea ice cover is driven by diverse and varying priorities to include socioeconomics, maritime safety and security, and resource management, as well as basic research science. Satellites provide an important and cost effective platform for instruments designed to monitor basin-wide changes in the volume of ice cover and snow pack depths. The primary focus of NRL and NASA is to collect data to aid in the validation and calibration of these data sets to further optimize instrument suites and the development of predictive sea ice models. In March 2011, a nine kilometer-long survey line was established on the sea ice cover by CRREL and NRL near the U.S. Navy Arctic Submarine Laboratory ICEX2011 ice camp. It was strategically located to cover a wide range of ice types, including refrozen leads, deformed and un-deformed first year ice, and multiyear ice. A highly concentrated set of in situ measurements of snow depth and ice thickness were taken along the survey line. The first of its kind ICEX survey has proved to be of great value to both NASA and NRL in terms of better understanding the capabilities of airborne and satellite based instruments to measure varying ice types. This will aid in achieving a resolution that is adequate to minimize the degree of uncertainty in models that forecast future conditions and for monitoring decadal variability. Once the survey line was in place, NASA IceBridge — a six-year NASA mission, and largest airborne survey of Earth’s polar ice ever flown – flew a dedicated mission along the survey line, collecting data with an instrument suite that included the Airborne Topographic Mapper (ATM), a high precision, airborne scanning laser altimeter; the Digital Mapping System (DMS), a nadir viewing digital camera; and the University of Kansas ultra-wideband Frequency Modulated Continuous Wave (FMCW) snow radar. The IceBridge measurements were further leveraged by complementary airborne measurements taken by NRL and submarine ice draft measurements. “We plan to use this set of data to characterize the error on the IceBridge snow depth and sea ice thickness data products as a function of ice type,” adds Gardner. “These results will also be applied to improve understanding of new sensors.” Sensors include the IceBridge snow radar, NRL radar altimeter and the European Space Agency CryoSat-2 satellite carrying a state-of-the-art Synthetic Aperture Radar (SAR) Interferometer Radar Altimeter, or SIRAL. Improved understanding of these measurements and their accuracies will allow scientists to develop new algorithms to incorporate this information into regional sea ice models used by the research community. The error estimates will also help tie the Ice, Cloud, and land Elevation Satellite (ICESat) and future ICESat-2 records together. Remote techniques to monitor sea ice extent in all seasons are well developed – these observations reveal a dramatic decline in summer sea ice extent since 1979, when satellite records became available. Further, they indicate that the decline has been facilitated by a dramatic decrease in the extent of perennial or multiyear ice. Combined estimates of ice thickness derived from submarine records between 1958 and 2000, and ICESat laser altimetry from 2003 to 2008, provided the longest-term record of sea ice thickness observations. These data suggest a decrease in the mean overall thickness of the sea ice over a region covering about 38 percent of the Arctic Ocean. The ICESat satellite has been critical to meeting the goals of NASA’s Cryospheric Science Program by providing ice elevation information at continental scales with high spatial resolution. As of October 11, 2009, ICESat stopped collecting science data – increasing the urgency of continued observations during IceBridge missions. ICESat-2 is planned to launch no sooner than 2016. This work directly addresses priorities to improve the utility of IceBridge data to estimate ice thickness and snow accumulation on Arctic sea ice. Because of its fundamental nature, the results from this research will also contribute to the priorities of improved understanding of the mechanisms controlling sea ice cover. These include quantification of the connections between sea ice, ocean and the atmosphere, and validated and improved predictive models of changes in sea ice cover, especially in the coming century, as well as, implications of these changes to the ocean, atmosphere, surrounding land areas and global system. The proposed work also addresses Arctic-related objectives of the US Navy, the Study of Environmental Arctic Change (SEARCH), and the U.S. Global Climate Change Research Program. The Marine Geosciences Division conducts a broadly based, multidisciplinary program of scientific research and advanced technology development directed towards maritime and other national applications of geosciences, geospatial information and related technologies. Research includes investigations of basic processes within ocean basins and littoral regions. Models, sensors, techniques and systems are developed to exploit this knowledge for applications to enhance U.S. Navy and Marine Corps systems, plans and operations. Could Arctic Sea Ice Decline be Caused by the Arctic Oscillation? While the IPCC claims that recent Arctic sea ice declines are the result of human-caused warming, there is also convincing observational evidence that natural cycles in atmospheric circulation patterns might also be involved. And unless we know how much of the decline is natural, I maintain we cannot know how much is human-caused. In 2002, a paper was published in the Journal of Climate entitled Response of Sea Ice to the Arctic Oscillation, where the authors (one of whom, Mike Wallace, was a co-discoverer of the AO) shows that changing wind patterns associated with the AO contributed to Arctic sea ice declines from one decade to the next: from 1979-1988 to 1989-1998. The Arctic Oscillation involves sea level pressure patterns over the Arctic Ocean, North Atlantic, and North Pacific. Since sea ice moves around with the wind (see this movie example), sea level pressure patterns can either expose or cover various sections of the Arctic Ocean. When there are many winters in a row with high (or low) pressure, it can affect sea ice cover on decadal time scales. Over time, ice can become more extensive and thicker, or less extensive and thinner. There is a time lag involved in all of this, as discussed in the above paper. So, to examine the potential cumulative effect of the AO, I made the following plot of cumulative values of the winter (December-January-February) AO (actually, their departures from the long-term average) since 1900. I’ve attached a spreadsheet with the data for those interested, updated through this past winter. Consistent with the analysis in the above-cited paper, the sea ice decline since satellite monitoring began in 1979 was during a period of persistent positive values of the AO index (note the reversed vertical scale). Since the satellite period started toward the end of a prolonged period of negative AO values, this raises the question of whether we just happened to start monitoring Arctic sea ice when it was near peak coverage. Note that back in the 1920’s, when there were reports of declining sea ice, record warmth, and disappearing glaciers, there was similar AO behavior to the last couple of decades. Obviously, that was before humans could have influenced the climate system in any substantial way. I won’t go into what might be causing the cyclic pattern in the AO over several decades. My only point is that there is published evidence to support the view that some (or even most?) of the ~20 year sea ice decline up until the 2007 minimum was part of a natural cycle, related to multi-decadal changes in average wind patterns. This is what sets WUWT apart. It may cherry pick the Bering Sea ice, but it isn’t afraid to admit, “The Bering Sea stands in stark contrast to the rest of the Arctic ice cap, where sea ice extent was below average in both January and February”. That is the difference between science and propaganda. Prognosis? Quick decline in extent. However it is a normal extent. Something that will be quickly dismissed by Warmists who have gone from delusion to fraud. Signs of the global cooling regime to begin in 2017. Mother Nature is warning all of us about this new regime – and I, for one, am all ears. An already relentless melting of the Arctic greatly accelerated this summer a sign that some scientists worry could mean global warming has passed an ominous tipping point. One scientist even speculated that summer sea ice could be gone in five years. Greenland’s ice sheet melted nearly 19 billion tons more than the previous high mark, and the volume of Arctic sea ice at summer’s end was half what it was just four years ago, according to new NASA satellite data obtained by the Associated Press (AP). “The Arctic is screaming,” said Mark Serreze, senior scientist at the government’s snow and ice data center in Boulder, Colorado. Scientists from the U.S. Naval Research Laboratory Marine Geosciences Division are assisting NASA, the US Army Cold Regions Research and ……………..
Will Dr. James Hansen be part of the ‘necessary’ calibration team? Arctic ice retreat of 1922 is just a figment of ‘denialists” imaginations. We must make 1922 go away. Hailing Michael Mann……………..
It’s worse than we thought! Head for the hills…………………. and I didn’t speak out because they ate my garbage and my dog. Exactly. They tried it with Arctic sea ice extent and I pointed them to the record Antarctic extent. They pointed to the warm USA and I pointed them to the unfortunate cold weather deaths in Europe this winter. And so on. It’s just the weather and the climate has always and will always change. It’s changing now but Warmists think it’s in their preferred direction. What’s so cute about a ten foot voracious carnivore that considers you breakfast as some delusional campers found out not too long ago ? Kara and Barents yes, but Laptev has been solid since mid November. Lack of hurricanes is … hey, can you count to a billion? Is this news to scientists at Cryosphere Today, NSIDC, NASA, NCAR and the thousand other climate agencies with climate scientists tripping over each other in the halls? Is this an Epiphany for the IPCC scientists? Although a geologist and an engineer with a bit of understanding, am I ahead of many of the dyed-in-the-wool climate scientists? Thank you for this WUWT and Roy Spencer. All that Sea Ice should make this years Deadliest Catch fun! So when the usual Summer melt season starts. We’ll hear cries of ‘unprecedented’ melting, starving and drowning polar bears, not enough ice for seals and walrus and all the other Arctic scares stories. Once some of this above average amount of Bering sea ice starts to go into decline by the usual AGW/CC Chicken Little brigade. 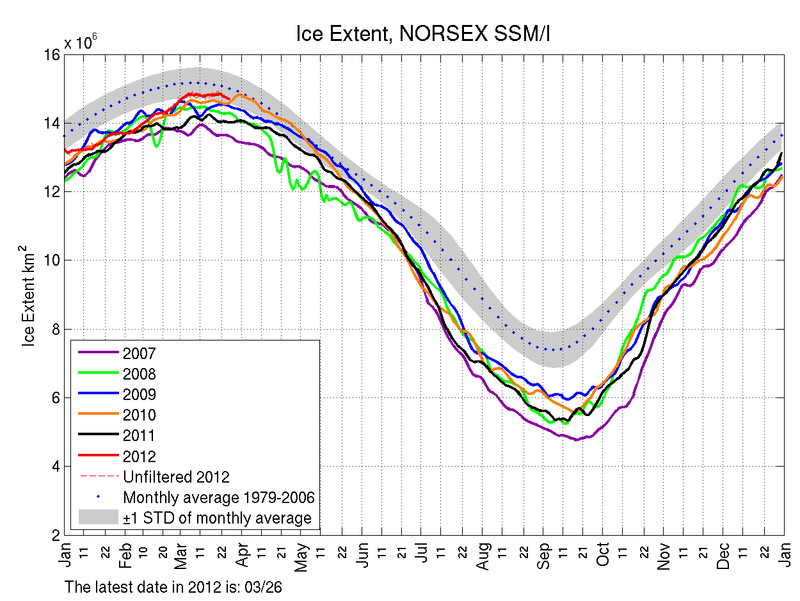 But the combined Sea Ice Area in the Arctic is only 2.6% under the 79-08 mean. About 97.4% of that average. Very respectable. And the Antarctic Sea Ice Area is still about 10% above the 79-08 mean. I hope the polar ice caps keep up this recovery, not because I want it colder, but because it is the only visual thing that will put the warmists totally out of business. It’s changing now but Warmists think it’s in their preferred direction. It’s not in warmists preferred direction. That’s the whole point. Now’s a good time to make a simple over under bet. Will the 2012 minimum be Over the 2011 minimum, or under? Those folks who predict colder days ahead and a coming ice age should speak up. Um, no, it’s more substantial than that. Crops grow better in warm, they grow less or die in cold. Learn the term “degree days” and look up “first and last frost dates” when it comes to gardening. So, you see, “Warm is GOOD, Cold is BAD” is a statement about food, about not wanting a mile of ice over Canada, about wanting to preserves species and ranges as they are today, about wanting more fuzzy furry things to live rather than die, and even about wanting polar bears to have an easier life. (They do better hunting through holes in melting ice and populations have exploded in warm times, they die off in cold ones.) Oh, and yes, it does feel nicer too. But I enjoyed it more when I was a kid and could lay out in the sun more. Now I have to spend more time indoors working. Go camping twice this year. Once in June in mid-latitude low elevation areas (whatever continent you are on, but somewhere like Sydney, San Diego California, or coastal Italy). Then again in February on a mountain top. (Like near Tahoe, in the Alps, or up the mountains of New Zealand. Dress in shirt, pants, tennis shoes, and light jacket in both cases. Stay 2 weeks with 2000 Calories of food per day. Sleeping bag under open sky in both cases. Then report back on which is better, warm or cold… and how much age matters…. • The planet has been warming naturally since the LIA. The warming trend has not accelerated. • Global warming since the LIA has remained within clearly defined parameters that are the same whether CO2 was 280 ppm or 392 ppm. Those parameters have not been exceeded since CO2 began to rise. THEREFORE the rise in CO2 has made no measurable difference in the rate of global warming. Reputable scientists have said that it is possible that the rise in CO2 has no effect, or even a cooling effect. I don’t know the answer, but I do know that the predictions of accelerating global temperatures have been falsified by direct observation. Conclusion: the effect of CO2 has been greatly overestimated. Global warming since the LIA appears to be mostly or entirely natural. Human emissions are not causing any measurable acceleration in the warming trend, therefore the CO2=AGW conjecture is either falsified outright, or the real effect of CO2 is so small the it can be completely disregarded for all practical purposes. I invite the Teenager to try and refute the logic of the natural global warming trend since the LIA, as expressed here, instead of posting his strawman arguments. It is impossible to show the cause. Causes are never observed. Further, you cannot even analyze the problem as you try to because you first have to account for all other causes and then you have to understand that the physics requires time for the cause to have an effect. You should remember what Lindzen, Christy, spenser, monkton and Singer told you about C02. Smokey, The unfortunate thing about Girmas old chart is that it is wrong. Just a heads up folks – Hansen (repeated in lecture Mar 20 @ Willamette Univ in Salem, OR) refers to “ice volume,” and that it is consistently dropping in both the Arctic and Antarctic. He conveniently avoids “ice extent” in the Arctic when it suits his purpose, and lies about it in the Antarctic when it doesn’t. Could one of you regulars help this forester understand this better? Is ice volume dropping, staying more or less the same within a range that doesn’t raise concern, or increasing? Just hedge your bets. Doing a google search on “arctic ice free by” (without the quotes) shows that there are multiple sites that say by the summer of 2013, or 2014 (from Nobel prize winning Al Gore [if he’s wrong does he have to give the prize back? ]), or 2015, or 2016, or 2040, within 10 years (from 2009), within 30 years (from 2011), etc. It is impossible to show the cause. Causes are never observed. did you tell that to Ramsdorff and Foster? OK, let’s say for the sake of discussion we throw out that chart. Then what? Then nothing changes, that’s what. How many charts do you need to convince you that the long term trend line since the LIA has not changed? [It is actually trending down; note the green line]. There is still no accelerated warming, thus the effect of CO2 is still too small to measure. You should really try to accept the fact that you might be wrong about the effect of CO2. It might have a much smaller effect than you think. That’s what the planet is saying. Unless you’re saying the observations are wrong, too. The Arctic ice snapshot compared to last year looks denser this year. What seems striking about Arctic Sea ice is its variability irrespective of temperature – as numerous people here have posted, the ice build-up is more dependent upon wind speeds and direction. For example, there’s no way a wooden ship would want to try to make its way through the ice if it were as thick as the photo above shows. Graphs of the earliest instrumental temperature records from NOAA show the coldest years on the globe (out of the last 150) were the decades of 1890s and 1910s. Yet, in 1890 a west-to-east Northwest Passage attempt succeeded in sailing through the Bering Sea, around the Alaskan peninsula, to the mouth of the Mackenzie River; and in 1910, Roald Amundsen succeeded (east-to-west). Here’s my transcription (from pdfs of the old papers) of the former, lesser-known event, as it appeared on Monday, October 27, 1890, in the Boston Daily Globe and the Daily Alta, in California. SAN FRANCISCO, Cal., Oct. 26.—The whaling schooner Alton, Captain. Newth, arrived at a late hour last night from the Arctic. She is the second of the whaling fleet to bring news from the north. The Alton reports a very poor whaling season. The most important news brought by the Alton was the details of her own attempt to reach the open Polar Sea and the northwest passage. The whaling season being so poor and Capt. Newth finding the Arctic remarkably clear of ice, determined to push onward, and if possible find the long-looked-for northwest passage. Although the little craft is but 84 tons burden, she succeeded in going further north than any sailing vessel has in years. She sailed beyond the Franklin range of mountains, almost to the mouth of the Mackenzie River, for which point the captain aimed. He was finally driven back by the ice. The turning point was 35 miles beyond Hirschell Islands opposite the mouth of the Mackenzie. The significance of this seems to be that the ice extent is constantly being affected by winds. In the coldest time of the Dalton Minimum (much colder than today, according to warmists), the Alton, circled the entire Alaskan peninsula, through the Bering and Chukchi Seas, and all the way to the Beaufort Sea before turning back. I swear Smokey I did not see your comment before I also decided to reply “You first”. So Mosher, what is it? If lazy teenager is typical of his username’s generation I bet he’s a great team player on World Of Warmcraft. Ah, fantasy, that great escape for the mentally active and befuddled. We can measure sea ice extent with precision from satellites, but measuring sea ice volume is much more problematic. So it is easier for people like Hansen to make claims about ice volume which can’t easily be refuted. Having said that, Arctic sea ice volume certainly declined along with ice extent up to 2007. Has volume continued to decline since 2007? Possibly by a small amount, but we don’t really know with any certainty. The interesting question is why multi-year ice is melting faster than new ice? The likely answer (highly likely IMO) is that older ice has more black carbon embeded in it, that concentrates on the surface as the ice melts decreasing its albedo and accelerating the melt from solar insolation. There is little multi-year sea ice around Antarctica, so volume and extent are pretty much the same. I think you need to really look at the trend of temperatures overall rather than at one specific point in time as seasonal weather can have dramatic effects that cause people to overlook what is really happening. The winter has been dominated by the Arctic Oscilliation and the breakdown of the polar vortex. For about 60% of the winter, the vortex re-established itself over Alaska (as well as over western Siberia). This brought cold Arctic air to Alaska and the Bering Sea and brought warm Pacific air across the rest of the North America. It hasn’t always operated like this over the whole winter but much, much more often than is usually the case. Is that a global warming signal or a global cooling signal or just something that happens every now and again. I vote “every now and again”. The rest of the planet has been in typical La Nina conditions. In the recent few weeks, the Arctic Oscillation has gone back to more normal conditions in which the La Nina-influence keeps the northwest part of North America cold and the US South-east/East warmer than normal. Weather; (something climate science has forgot about – wierd since this is what it is supposed to be about you would think). The real world is a continuum of processes. For intellectual convenience we call an earlier point in a process continuum, a cause, and a later point, an effect. But all causes are effects (of earlier causes), and all effects are causes (of later effects). Thus all causes can be measured (as effects). Lazy teen is smarter than you old timers.Got an A in environmental science to prove it. Learned from the best teachers that learned from the smartest professors and so on. That is modern science now I guess. You are wrong if you question anything. They are the smartest cause they got an “A” . How dare you question their authority! End of discussion. And Mosher needs to fully explain the physics of CO2 (rather than just saying there is physics). This should fully cover the quantum physics involved in let’s say a single photon of sunlight which comes in at noon on Sunday. Tell us the story about the average 44 hours the energy represented by that photon spends time in the Earth system. The solar photon hits a rock at noon on Sunday, then what happens. The climate models should be able to fully tell the story. Something like 1.6X10^42 solar photons start this story every day and 1.0X10^44 IR photons end the story every day flying off to space at the speed of light. CO2 does what to those numbers. Clearly, the Arctic air is more than cold enough to form ice every winter. It is claimed that snow cover insulates the ice from cold and warm air slowing freezing and melting. Wind can blow the snow off and accelerate freezing or melting. Wind and currents can move the ice and water. Dust and soot can absorb sunlight to speed melting. There may be other influences. 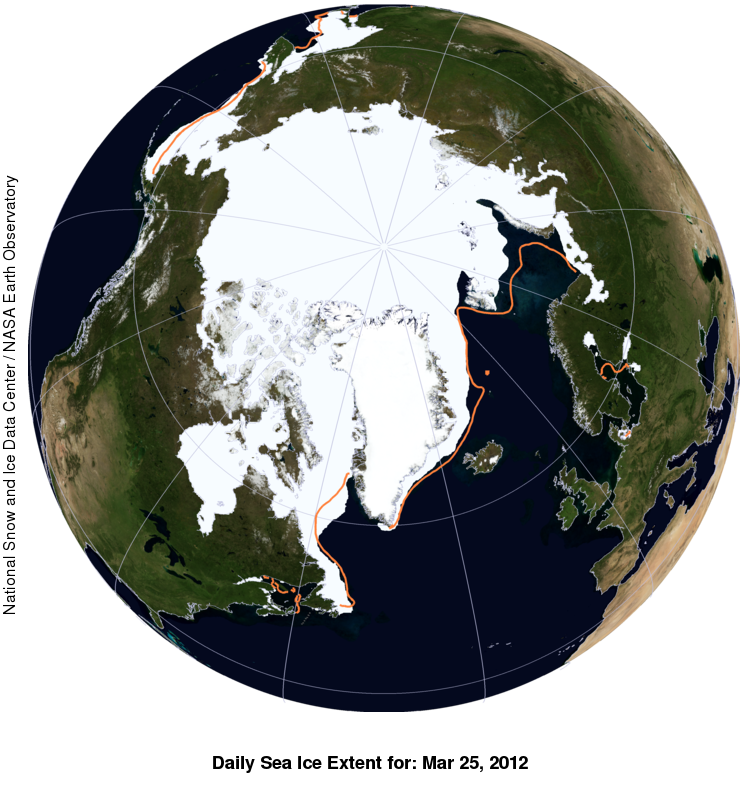 So what does Arctic ice extent have to do with AGW? On second thought, Steven, I’ll ask Prof Richard Lindzen if CO2 is the cause [that is impossible to show], since you almost never respond to our questions. Professor Lindzen, is CO2 the cause of “”climate change”? Climate is always changing. We have had ice ages and warmer periods when alligators were found in Spitzbergen. Ice ages have occurred in a hundred thousand year cycle for the last 700 thousand years, and there have been previous periods that appear to have been warmer than the present despite CO2 levels being lower than they are now. For small changes in climate associated with tenths of a degree, there is no need for any external cause. The earth is never exactly in equilibrium. The motions of the massive oceans where heat is moved between deep layers and the surface provides variability on time scales from years to centuries. Recent work suggests that this variability is enough to account for all climate change since the 19th Century. Well, there you have it. There is no need to invoke CO2. The causes of natural variability are largely due to the oceans. And according to Occam’s Razor, any extraneous entities should be discarded from the explanation, because the simplest explanation is usually the correct explanation. CO2 is an unnecessary entity when explaining tenths of a degree of temperature variability. Roy Spencer is selling the premise of a paper by John Michael Wallace, published in 2002, suggesting that the Arctic Oscillation was responsible for the loss of Arctic sea ice. It turns out, in a discussion of the record low of summer Arctic sea ice in 2007, Wallace questioned the premise of his own paper. “Some scientists who have long doubted that a human influence could be clearly discerned in the Arctic’s changing climate now agree that the trend is hard to ascribe to anything else. Thanks Phillip, appreciate your answer. Which 2011 minimum? University of Bremen, using the 89GHz channel of the AMSR-E instrument (on the Aqua satellite), 15% sea ice concentration, decided 2011 had a lower Arctic minimum than 2007 (graph), despite what the others said. Did you miss the press release? Granted that was so far out of line from what IARC-JAXA got from the same raw data that the AMSR-E instrument died from embarrassment a month later, but it was still a result. The U of B is temporarily providing SSMIS maps until they get the new AMSR-2 data, expected mid-2012, it’s likely they’ll put together an integrated graph and dataset after a while. So which minimum? To what minimum percent concentration? And that’s extent, not area, right? You did mean Arctic sea ice, not Antarctic, yes? What is interesting about this image is that St. Paul island (part of the Pribilof Islands) can be seen surrounded by ice right at the lower center of the view. I went out to St. Paul in October of 1966 with all the water around it in liquid form. Each night we could see the lights of the Japanese fishing fleet on the horizon. It got cold and dark during the next 4 months. Soon the fleet had gone. And we could not really see how frozen the ocean had gotten until we jumped on a Reeves Aleutian plane and flew away from the place sometime in early 1967 and got this birds eye view to the horizon of a frozen ocean of ice. Salt water frozen solid. I wish I could have gotten that view over the next 10 years to see how St Paul looked each January. Perhaps the unclassified military images are available somewhere. That was cold and very other worldly. Give me warm any day. Hmmm, the Bering Sea ice forms initially in late Autumn in the month of November, when ‘Sea Surface Temperatures’ fall to minus 1.7 degrees Celcius. Under these low temperature conditions, salt water freezes and the cold pool formed on the lee side of St Lawrence Island Polynya, becomes an effective large ice making factory, for the Bering Sea. The resultant floating pack ice in the Bering Sea, can last until June the following year under special circumstances. In addition, due to the fact, regular severe winter storms occur every three to five days in the region, the floating pack ice is quite active and unstable, as the various forces of nature interact with one another to move it around. It also explains why the semi annual US Navy Ice Exercise, is held in the same region, when the peak one year old floating pack ice thickness, which can vary in thickness from a very thin one centimeter freshly formed over a closing lead , up to one meter in thickness ice flow block. The peak ice thickness in the Bering Sea, is approximately one meter, in thickness and is reached in the middle of March, just before sunrise at the North Pole. After the March Equinox, or sunrise at the North Pole, the floating pack ice in the Bering Sea, breaks up rapidly and by June Equinox, when the sun is at its highest point or zenith over the North Pole, the vast majority of the pack ice has completely melted, back into the sea from whence it came. In this post you use the Temperature of Central England as proof that global warming we are seeing is nothing special. Can you really claim that Central England can represent the entire NH as a proxy? This doesn’t make sense to me. The temperature in my city was 40 degrees above normal for 5 days last week breaking records by 10F. Are we entitled to claim that the entire Northern Hemisphere set such records. Give me a break. I think that the 2012 minimum will be over the 2011 minimum ,the AO in the winter before an arctic summer is not a good indicator of how much ice will melt that summer , summer 2008 had more ice than summer 2007 and 2009 had more ice than 2008. 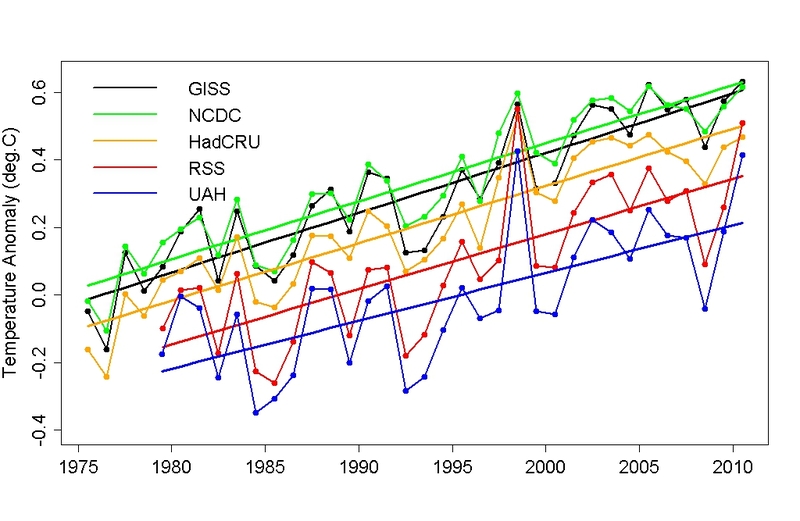 Let us focus on 1996 versus 2011 on the RSS data set. Both were La Nina years. Both had low sunspot numbers. Your graph posted above only goes to 2010, however if it were to go to February 2012, then there is no way 1996 would be lower than 2012. Check out the real RSS graph below. Note that the anomaly for February 2012 is below the lowest number that was reached in 1996. (-0.12 versus -0.08) So I just do not accept this stuff about the present La Nina being the warmest La Nina. Also note that the slope is 0 going from a La Nina to a La Nina and NOT from an El Nino to a La Nina. “Unfortunately” the 2012 La Nina goes lower than the 1996 La Nina. I cannot help that. You tried pulling out that same stuff last year. Maybe you should have read Anthony Watts’ reply as to why that’s a non-issue. What needs to be added is that the UAH and RSS data bases have been shown to be more sensitive to the El Nino/La Nina cycles than the thermometer data base. Are you planning to keep dredging that up every year or so until it miraculously suddenly becomes significant? I can’t wait to see how this all plays out on Deadliest Catch when the new season starts on April 10th. I looked at the high res image and it looks like St Paul Island is still completely cut off by ice. Pretty amazing winter they’re having! With the greatest of respect, so what? El Nino, solar cycle and volcanoes are either short-term or stochastic events. There are other climatic ‘beats’ in the centennial and millennial timescale which, forgive me for pointing out, have nothing to do with human beings either. We have no detailed records of ice extent before 1979 and reports before that suggest anecdotally that major reductions in ice volume have happened many decades ago. This does not prove that things are solely cyclical, but it hints that we should assume that as our null hypothesis until proven otherwise. I am of the strong opinion that nature is far more robust, vigorous, variable and self-correcting than most are prepared to countenance and the geological record says that 2012 is in no way anything but within the normal boundaries of variability. I am also of the strong opinion that scientists have backed themselves into a corner over their unverifiable carbon dioxide hypothesis and that until that dogma is unwound, climate science will continue to be a danger, as well as a fraud, to mankind, rather than in its service. Long-term climate variability requires scientists to collect data for generations, something completely incompatible with publishing 2 papers a year for 40 years. It would be best if that data collection were tasked to be carried out by those not requiring such short-term publications to secure their careers and livelihoods. 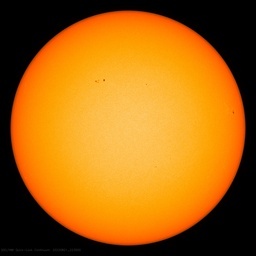 It is unlikely that any predictive model for solar activity will be properly tested in under 110 years, that being 10 or so solar cycles/5 Hale cycles. Retrofitting a model to past data is not predicting the future, which is the acid test for a model’s reliability. It is unlikely that any detailed predictions of oceanic behaviour can be achieved with less than 300 years of data, that being 4 or so complete PDO/AMO cycles. Scientists witter on without adequate data. The same can be said about arctic/antarctic sea ice. 1. A major volcano eruption. 2. A freak winter with high snowfall followed by a volcanic eruption, preventing summer snow melt across a significant area. 3. Significant changes in magma emissions on the ocean floor, thereby altering oceanic temperatures. 4. A solar grand minimum. Nowhere do scientists debate this with the public. It’s about time they did. Has anybody asking the locals what is happening? Well I am in the unusual position that my daughter in law comes from the Pribilof’s in the Barents Sea and she still has family there whom she keeps in touch with. Asked whether global warming is an issue the answer is a resounding NO. Some years the ice is there sometimes not. Smokey does not deny there has been global warming, indeed he affirmed there has been global warming. Yet you say he’s taking the UAH temperature graph and claiming it shows no sign of global warming. (…) There is still no accelerated warming, thus the effect of CO2 is still too small to measure. You should really try to accept the fact that you might be wrong about the effect of CO2. It might have a much smaller effect than you think. That’s what the planet is saying. Unless you’re saying the observations are wrong, too. Those of us with normal reading comprehension will note the UAH graph, the last link, is used when discussing there is no accelerated warming and the effect of CO₂ is small. The graph is not used by Smokey to deny global warming. Thus what you have said is not credible. Try harder. I don’t worry about the Arctic sea ice. I recall reading that ice around the globe has been contracting for quite some time. I won’t worry about ice or weather events or even global warming (CAGW or otherwise) until they start growing cotton in Greenland. Well, at least corn for fuel. Cause, until then, even silly ol’ me can understand it’s already been this warm and since we’re coming out of the LIA it should get a little warmer….it’s natural. I guess they still teach this stuff in school. Al Gore won the Nobel PEACE prize! Not a shred of science in that. “Smokey does not deny there has been global warming, indeed he affirmed there has been global warming. Yet you say he’s taking the UAH temperature graph and claiming it shows no sign of global warming. I have read what he wrote more carefully than you have. You left out an important thing Smokey said before the quote that you mentioned. The context is important. ” The planet has been warming naturally since the LIA. The warming trend has not accelerated. My first point was that he used the Central England temperature to claim that global warming has not accelerated since the little ice age, but that is not a reasonable proxy for global or even NH temperatures. The UAH data since 1979 cannot show that there has been no acceleration since the little ice age. It doesn’t go back far enough. There has been acceleration in warming during the 20th century, and especially since 1970. It is known that UAH is more sensitive to ENSO. It turns out that the 2011 La Nina is way more negative than the 1996 La Nina. These factors explain the comparison between the UAH 1996 and 2011 figures you mention. It turns out that the 2011 La Nina is way more negative than the 1996 La Nina. There are different ways to compare La Ninas. Also, 2011 had two La Ninas. Let us focus on the second one that impacted the February 2012 anomaly. See the following. The average of the blue numbers from September 1995 to March 1996 was 0.80. The average of the blue numbers from September 2011 to January 2012 was 0.86. So the latest one was only marginally more negative. I said both were low, however the 2011 had a higher number than 1995 so this more than compensates for the slightly higher La Nina. Neither year had a big volcanic eruption. So I see no reason for the present anomaly to be above that of 1996 with all adjustments considered. The other graph that you use is the UAH temperature graph, claiming that it shows no sign of global warming. You said “no sign of global warming”. I pointed out you were wrong. Now you want to pretend and make people believe you said ‘no sign of accelerated global warming’. Nope, not gonna happen. Try harder. I hope these links work,I think that they show that sea ice extent at minimum increased in the 1950s and 1960s and decreased in the 1990s ,I believe that they also show that the increase /decrease in minimum ice preceded the change in the AO. Here is the UAH warming record going back to 1979 when you properly pull out the Volcanoes, the ENSO, AMO and Solar (TSI) influences [as compared to Tamino who poisoned his own model so that the trend was increased]. Only 0.041C per decade versus the IPCC AR4 mean which is 0.207C per decade over the period. Compared to the actual UAH temperature record, this reconstruction works about 5 times better than Tamino’s [although you would not be able to tell since he never actually showed you how his reconstruction compared to the actual record]. Bill Illis just destroyed both your argument and Tamina’s invisible reconstruction. The first graph that Bill posted above shows no acceleration of the warming trend since 1979, when CO2 was substantially lower than now. By using a long term trend chart, your argument that it does not apply globally is greatly diminished [and note the first link I posted shows very similar trends throughout the Northern Hemisphere]. It is unreasonable to presume that only those cities experienced the same warming trend. If you have evidence contradicting the non-accelerating trends in all those cities, produce it. Note also that Arctic ice completely covers the north shore of Newfoundland and that the ice stretches so far eastward of the island. Similarly, look how the ice is pushed up tight against Hokkaido, Japan (end of March even!). Remember a couple of years ago, Japanese cruise ship owners that used to take people out to see the ice sheet had to discontinue this trip because it was too far go to see the ice? Now you could travel on foot from Nome to Tokyo – now there is an arctic trek!! A long-time skeptic that has done a significant amount of work testing his opinions, crunching mountains of data and heeding the results. Like Jeff Condon at the Air Vent. No lover of the IPCC, Steve tries to speak truth to his clan and is mobbed by a bunch of armchair critics whose brand of skepticism is based on linking to graphs on the internet. I’m not sure why you do it, Steve, but good on you for trying. You and Leif deserve a medal of some kind. It doesn’t make sense to use one small area Central England as a global or NH proxy. The graph you linked shows the current increase in temperature as well as the one ending in 1735 was about 4C. The global land temperature hasn’t increased by 4C since 1950 it is more like 0.8C. Yo, dufus: “one small area”?? I provided a chart that showed a steadily rising temperature trend from Washington DC, in addition to London. The rise in CO2 did not measurably affect the steady rise in global temperature. Neither did the steady, non-accelerating temperature rise in Geneva, Switzerland. Nor in the steady, non-accelerating temperature rise in Berlin. Nor in the steadily rising trend in Copenhagen. Nor in the steadily rising trend in Minneapiolis. Nor in the steadily rising, non-accelerating temperature trend in St. Petersburg, Russia. Nor in all the rest, including New York City. None of those locations showed any acceleration in temperatures. What’s your lame excuse now? Those trends pretty much cover the Northern Hemisphere. Your alarmist scare tactics fail when compared with the temperature/CO2 record. Thus, your belief is falsified by real world data, which is clearly deconstructing the CO2=CAGW conjecture. So you need to start from scratch, with a new conjecture. This time, if you leave CO2 out of it you might be onto something. First, I’m using almost exactly the same process as Tamino [and have been for about 4 years now] (The difference would be that I’m using the AMO as well which Tamino did not – even though he put the AMO index into his database – and I’m using an updated version of Solar TSI – Tamino uses the PMOD composite which is known to be suffering from degradation in the satellite instruments it uses – I’m using the more accepted Lean 2008 TSI updated to the most recent time period). What was going on with the variables in February. – No volcano influence, aerosol optical depth is actually Zero right now, no influence. – Solar TSI is a little above average, about 0.4 W/m2 above the mean (Tamino uses a coefficient for this of 0.1 and I’m using 0.15 because it seems to be a better match) – So one could say temperatures are about +0.06C higher due to the solar cycle TSI. – AMO was more-or-less Zero, no influence. – The ENSO with a 3 month lag was about -1.0C times 0.115 (Tamino and I are using the same coefficient, so one could say that temperatures are -0.115 lower than normal due to the ENSO. Take -0.116C: add-back 0.115C for the ENSO; take out 0.06C for the Solar cycle. Tamino would get the same number if he updated his paper to today. So where is the global warming? I doubt that Tamino has said there is evidence of an accelerated warming trend over the last 30 years or so. Cite? Amen brother Steven, the word of faith! Speak it into being! Name it and claim it! You a friend of the Rev Kenneth Copeland?